MOPAKO™ BUILDER’S SPEC® Interior Latex is designed for new construction, commercial and residential repaint. 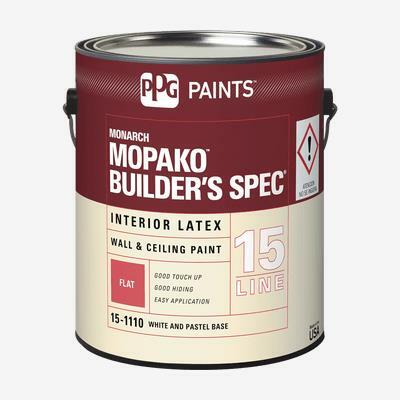 MOPAKO™ BUILDER’S SPEC® Interior Latex is recommended for use on properly prepared interior walls, ceilings, and trim. It is an economical solution for high volume projects requiring a high hiding product with good touch up when applied by spray, brush and/or roll on smooth surfaces. It dries to a uniform finish to help hide tape joints and surface imperfections. It is self-priming on drywall and meets the needs of painters, building contractors, and building managers.